I was on a quest in Seoul. Having done lots of research before going, I’d discovered that Korea has an equivalent to the Japanese taiyaki, a sweet full of red bean paste in the shape of a fish. The Korean equivalent… isn’t. In fact, the Korean equivalent is known as “poop bread”, because it is shaped as a turd. Who could resist? So I wrote down the train stations dong bang (poop bread in Korean) was meant to be available and set off on my quest. Sadly, the stall had closed at the station I went to, and I despaired of ever finding the mythical poop bread. But, lo and behold, exploring an outdoor mall in Insadong, we walked right up to the top of the spiral (like a knight climbing the spiral stairs to a fairytale tower) and what was there but a stall making fresh, steaming poop bread! I was so excited to buy one that the stall owner produced a huge pink poop bread hat for me to take a photo wearing. Yep. Not even joking. The poop bread itself was well-toasted on the outside and full of delicious red bean paste, the perfect prize at the end of a succesful quest. There’s really nothing like sitting in a garden bar on a summer night, especially when you’ve managed to escape work early! We headed over to Mint at about 4:30pm on a weekday for a friend’s farewell, and arrived to an empty bar, giving us a monopoly on service and our pick of the tables. I ordered a Hendrick’s and tonic, which was poured into a long glass with great care and served with a wedge of cucumber. 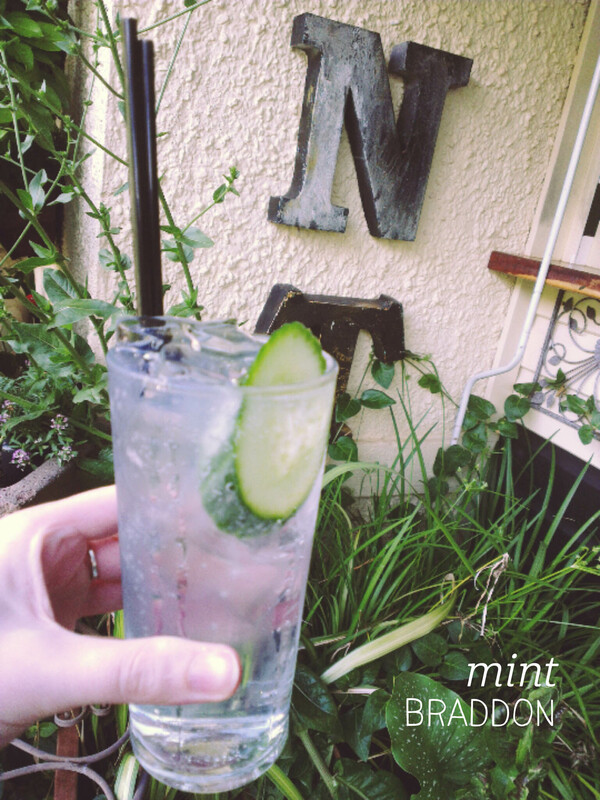 Unfortunately, the tonic tasted a bit watered-down, but the measure of gin was full and the service friendly. After lounging around for a couple of hours, we got peckish, so ordered a plate of hot wings and the pepperoni pizza. They came out promptly, and in serves of 6 (6 wings, 6 slices of pizza). The wings were quite salty but the dipping sauce was delicious and there was quite a bit of meat on each one. The pizza was the highlight though, with a perfectly thin, crispy base and minimal but tasty toppings in true Italian style: rich tomato, completely melted cheese and spicy pepperoni. I’ll be back to try their other pizzas and chill out in the leafy green space. Part Two: Next up I was a bit spoilt – the chef shared out a sample of the kingfish sashimi – it had a surprisingly tropical flavour, probably due to the coconut and corriander – followed by the kimchi and oyster pancake I’d ordered. Now, don’t get too excited, it isn’t okonomiyaki, but it’s still delicious (and covered in bonito flakes, yum!). The main flavour isn’t kimchi, as you would expect, but the sriracha sauce, and whilst it’s a small serving, it’s quite filling. I thought I could fit one more thing in, and while I deliberated, the chef dished me up a Sydney rock oyster with black vinegar and ginger wine. 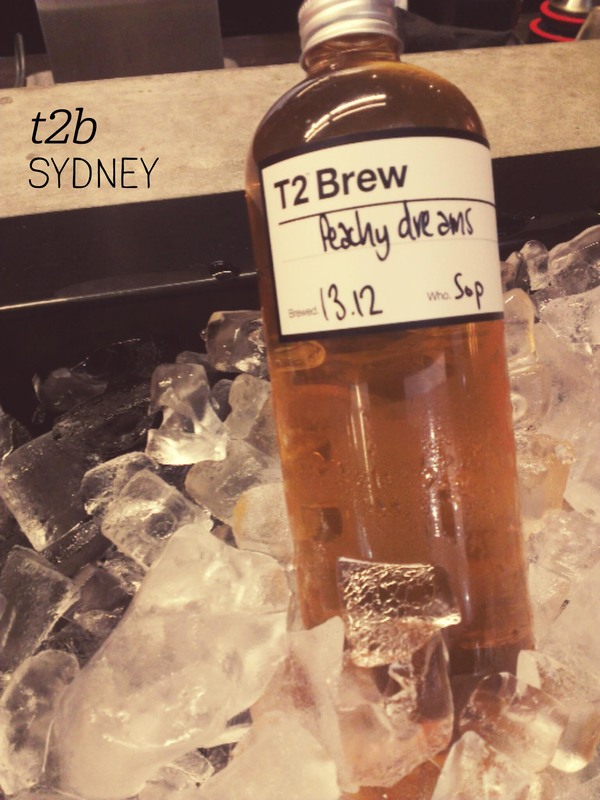 He explained that they used to use this combination on pork at Sage, and were just mucking around with flavours for the oysters. 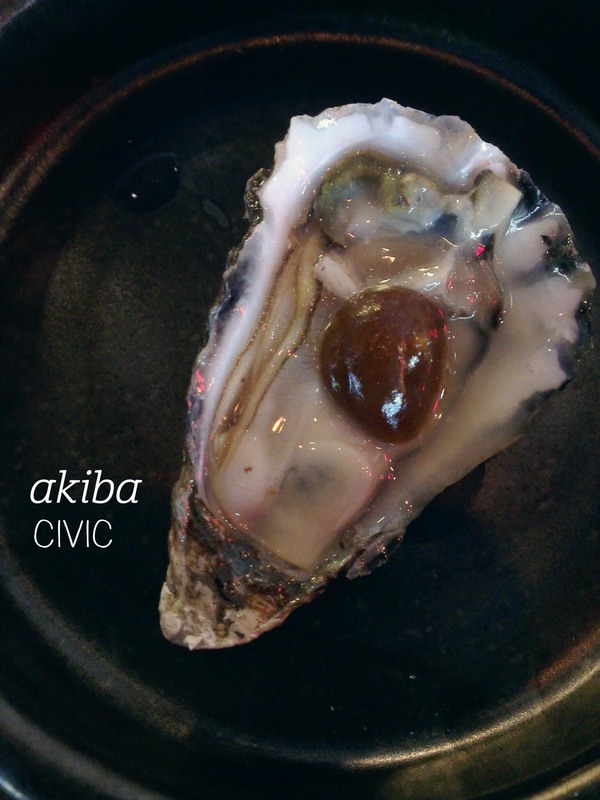 It’s a winner – very refreshing and vibrant, much like the attitude and vibe at Akiba. My final dish was the pork jowl pancake with pickled white peach – this was unexpectedly creamy and rich and I preferred it to the kimchi one. 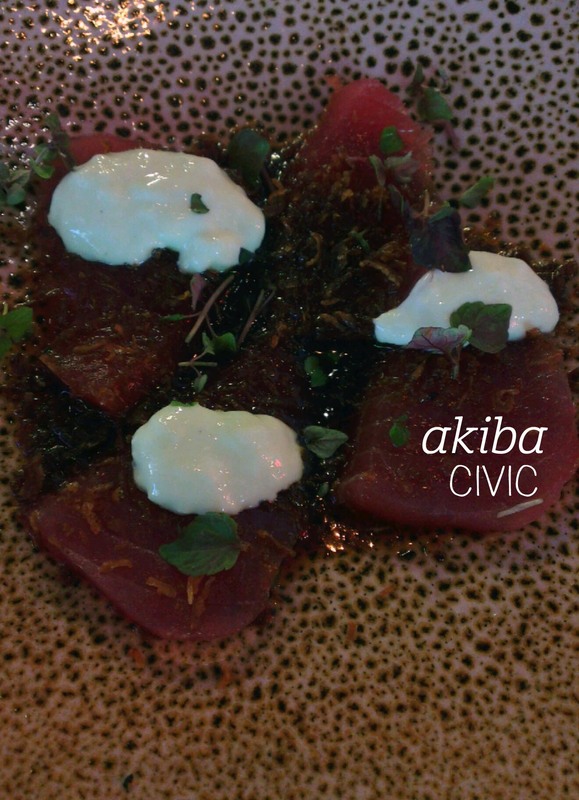 Akiba made a fantastic impression (and the chefs are great for conversation! ), being both considerate to a solo diner and so obviously energetic and excited about their food. Definitely a new Canberra landmark. 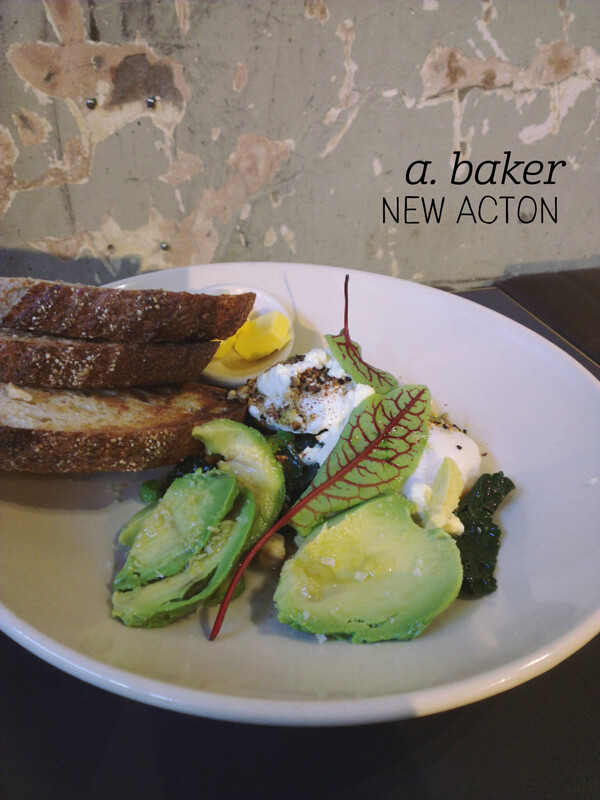 I do love a good weekday breakfast, and that is exactly what A. Baker in the New Acton Pavilion offers. The menu appears fairly traditional, but has a sophistication that is evident in the presentation and flavours. We sat along the charred wall, which has been retained from the fire that ripped through the building in 2011, and whilst I’ve heard mixed things about the service, our experience was that the staff were prompt and friendly. I started with a fresh apple juice – made with granny smiths it came out in a good sized glass and with just the right amount of froth. For breakfast two of us chose the poached eggs, which were beautifully presented – I added avocado and it went with the artisan bread and warmed butter perfectly. Let me just emphasise, the bread was heavenly. One of the two eggs was perfectly poached, the other had just gone a touch too far and was partially solid, but the whipped fetta and dukkah really made the dish, both being served in just the right proportions. This is a classy breakfast that I will be coming back for. Spanish is one of those cuisines that can be done very well, but often is done fairly averagely. Olé falls into the former camp, luckily for my friends and I who went for dinner one balmy Brisbane evening. We got a table easily, and decided to share a few tapas dishes. I picked the croquetas del dia, which turned out to be cuttlefish, and the pulpo con patatas (octopus with potato), and my friend chose the tortilla espanola and the gambas con chorizo (prawn with chorizo). Everyone’s Spanish language skills improved just by reading the menu! 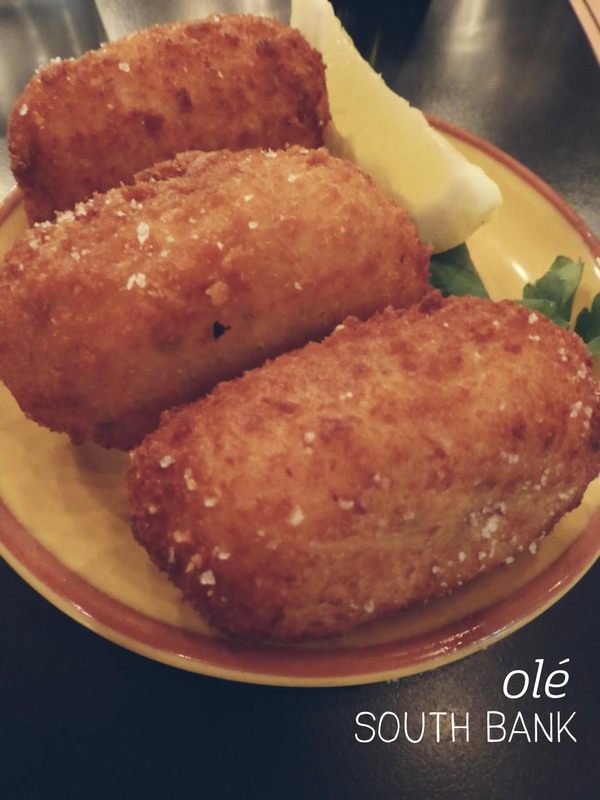 The croquettes came out first and were perfect – crispy on the outside, soft on the inside and not hot to the point of mouth-burning. I definitely ate more than my fair share of the octopus, which was soft and well matched with the potato and tomato paste it was served with. The tortilla was beautifully presented and was light and fluffy, and the saffron rice served with the prawns was to die for – a hint that their paella would be excellent! Brisbane definitely knows its tapas.